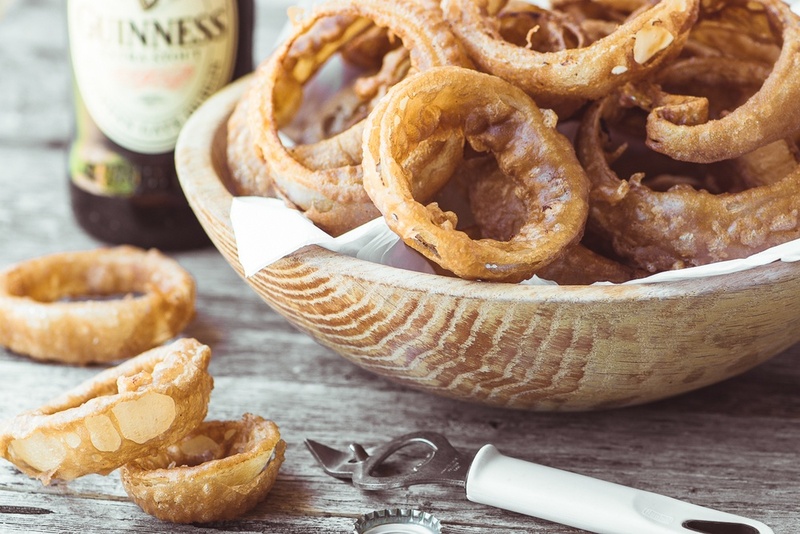 These Guinness Battered Onion Rings with a spicy curried mayo dip are the ultimate appetizer, these rings are gutsy and satisfying, no meal required! Put the flour in a bowl and whisk in enough Guinness to make a mixture similar to a thick pancake batter. When the oil has reached 350F, work in batches and dip the onion rings into the batter, and then into the oil. Fry, flipping them once or twice, for about 2 minutes, or until golden and crispy. Drain on paper towels. You can keep the rings warm in a low oven if you like, while you finish the rest. Stir the sauce ingredients together and taste to adjust any of them. Set aside until needed. Serve the onion rings piping hot, with the sauce.